We can’t quite believe that it’s four years since the London Olympics or that the Rio Olympics is upon us already. Zika aside, this is an exciting time for the best of British athletes and we’re really rather sad we can’t get any closer to the action than the gogglebox this time. The British love of cycling continues with an abundance of cycling events this summer. But these evening sportives and criterium in Cirencester’s Roman town centre will get wheels turning and pulses racing. Yes, we’re still harping on about Scarborough. While cricket might not be renowned for its cardiovascular benefits. This cricket festival is renowned worldwide for playing host to some of the world’s greatest cricketers. Since 1876 Yorkshire County Cricket Club has been playing a series of end of season matches in Scarborough. Where’ve you been all this time? Pitch your sun tent and beach towels on Bournemouth beach for a sky show to remember. By day crane your neck to watch some of the world’s best aviation and air acrobatic displays. By night let the show continue lit up by pyrotechnics. Half a million people descend upon Ashton Court Estate and the surrounding area for the best views of over 100 hot air balloons cruising the Bristol skyline. Want to get up there yourselves? Book helicopter and balloon rides in advance. Six pyrotechnic companies. Two August days. One competition to impress the people and the judges en route to being crowned firework champion. Too far to trek for a colourful night sky? Tie it in with a visit to the city’s Flavour Fest, which sees over 100 local food stalls and activities take over the harbour-side streets in the lead up to the firework antics. (And there’s always the Plymouth Gin distillery if you fancy a proper local tipple). Family friendly music festivals abound in the summer months. And what’s most delightful is that nowadays music festivals countrywide vary from rock and pop to folk and classical. But it’s definitely folk music that’s dominating when we go on the hunt for ‘free’ and ‘family friendly’. When someone offers you the combination of the Jurassic Coast, a seaside escape and bags of entertainment it’s rare for us to say no. So East Devon’s very own folk festival, which attracts more than 700 music and dance acts from around the world, kicks off August in fine folky style. Lincoln has been doing steampunk events longer than anywhere else. The city’s transformation by the arrival of the Victorian Steampunk Society has seen it named the world’s most steampunk city. And if you’re not sure what it’s all about, the weekend’s fashion shows, tea duelling, steampunk black market and flamboyant costumes will teach you more than a thing or two about the steampunk phenomenon and shed a whole new light on Lincoln. If you happen to have a ‘steaming’ hangover, hold on another week to the first weekend of September and Oxfordshire’s Bunkfest will blow your folk mind. Who knew there were this many Morris Dancing troupes?! A celebration of the country’s and county’s greatest folk musicians, dancers and craft beers and ciders, we (and about 10,000 other visitors to this Thames-side market town) say cheers to a low-key, free family event that has become a national folk treasure in just over 10 years. Since Robbie rocked Knebworth in 2003, music concerts set in the grounds of stately homes have become really rather normal (if still a little highbrow). But Lakefest is as much about the lakeside setting of this venue as it is about the music. Without making too much of a cliche of quality time with the kids, there are child and adult yoga sessions, watersports for you to try out on the lake and the action packed UK BMX Dirt Series Championship Final. If you’ve got some energy left for bopping, moshing and Dad dancing, rock the night away to Indie favourites such as Cast, Primal Scream and The Coral. Created with almost every parenting generation in mind, the music at this family friendly festival ranges from Echo and the Bunnymen to Manic Street Preachers, Will Young and Mark Ronson. But with kids in focus too, get down and boogie with them on the Kid’s Stage or make celebratory sandcastles in the Beach Area. If you need a dirty burger at the end of a night’s dancing you’ll doubtless be able to find one, but you’ll also find delicious food and drink stalls and boutique markets to spend your pocket money on. If the rugrats seem forever hungry for the next meal or snack, get yourselves to Jamie Oliver and Alex James’ food festival on a farm in the Cotswolds. It started with cheese (Alex produces it), then the ‘Chippy set’ landed in the local area, Soho Farmhouse sprang up and now this is the place to be and be seen. The event attracts big name musos like Mark Ronson and (ahem) The Proclaimers, not forgetting rather large crowds in a rather small Cotswold village. Garlic is one of the Isle of Wight’s proudest exports and a local favourite. It’s become such a ‘thing’ that they’re even using it to make beer (rather you than me). Unsure of how they’ll generate a whole weekend’s entertainment out of the humble, albeit stinky, bulb? Get yourselves and your preferred brand of chewing gum down there and find out for yourselves. 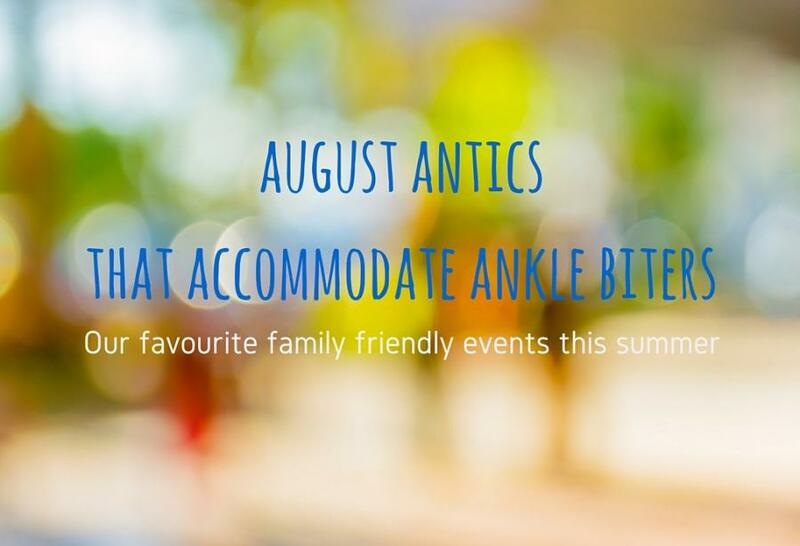 So whether you choose to sing, dance, race or eat your way through August, we hope this list goes some way to six weeks of school holidays full of fun for the whole family. The great British summer is here! (Just pack your cagoules).